Oh, how did Sunday come around so quickly? 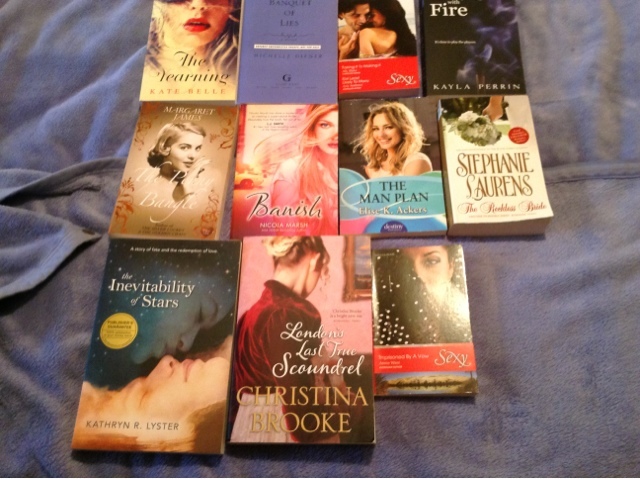 I returned home from conference with a pile of books - many freebies, a couple I bought. The exciting one for me was Bronwyn Parry's Darkening Skies, because it was out early just for conference. Ooooohhh, love getting a sneak peek. I bought it at the conference bookshop. It's the fourth book set in Dungirri...and it may be my favourite (but it's so hard to pick!). Anyway, it was a cracker read. Then I had Annie West's Imprisoned By A Vow in my conference goodie bag. I wanted a quick read so picked it up. Silly silly me. I thought I'd be able to read a bit and put it down...but alas, Annie West held me captive with my pain for Leila and my concern that she end up okay. Another great read. I think that's all I've managed since conference. On my holiday I took an iPad full of books, plus 3 print books. Do you know how much I read? Zero! My idea of a holiday is not zero reading - but somehow that's what I did. Guess lots of driving, sightseeing and snorkelling aren't conducive to reading. And you can guess that there was absolutely no writing either.